For years, the European Union (EU)’s agricultural trade has been one of the most controversially discussed topics, be it in the public debate or in academic research. Most recently, the negotiations of the Transatlantic Trade and Investment Partnership (TTIP) between the EU and the United States as well as the Comprehensive Economic Trade Agreement (CETA) between the EU and Canada have been heavily influenced by arguments related to agricultural trade. 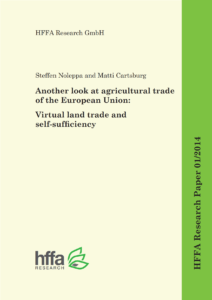 Against this background, the authors of the study, Steffen Noleppa and Matti Cartsburg (both HFFA Research), contribute to the discussion by taking a closer look at virtual land trade linked to the agricultural production of the EU. Virtual land trade refers to the use of agricultural land and natural resources hidden in the export and import of agricultural goods. One of their main findings is that although the amount of land virtually imported by the EU has decreased since 2007, the EU is still net importing close to 20 million hectares of virtual agricultural land. Despite all improvements, the EU still largely relies on the occupation of resources outside its territory in order to satisfy its internal demand. As some of the world regions which are net deliverers of agricultural land to the EU face resource scarcity and often have problems in satisfying their domestic demand, the authors consider an improvement of the EU’s land trade balance an absolute necessity. 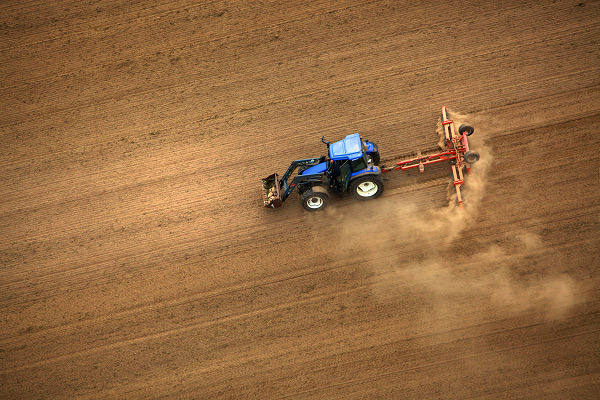 Increasing the EU’s agricultural productivity is seen as a promising option to do so. This is supported by the most recent data on agricultural self-sufficiency. While the aforementioned data indicates that the EU is very well integrated into world agricultural markets, the authors also find the EU to be especially dependent on certain crop imports – especially protein and oil crops – which must be imported at a large scale. Strong feed and fuel demands, paired with negative incentives to invest in agricultural productivity, are considered the main reasons. This research paper is the outcome of a multi-annual project aiming to continuously measure the EU’s virtual land trade and agricultural self-sufficiency. By using a revisited methodology and applying it to the latest available data, the resulting publication series sets an improved standard for the calculation of virtual land trade and various self-sufficiency indicators. This study’s conclusions can be downloaded below.